This story is from a current enrollee in NAPCA programs in Philadelphia, PA.
Kwong Sun Man lived in Hong Kong all his adult life with his wife with his parents living in Philadelphia, PA. As his parents aged, he decided to immigrate to the United States to take care of them. To improve his English, he took English as a Second Language (ESL) classes offered by the Center for Literacy for three months until he was connected with the Philadelphia Chinatown Development Corporation (PCDC.) The PCDC introduced him to the NAPCA Senior Community Service Employment Program (SCSEP) and he officially joined the program on February 19, 2018. After working for PCDC for two months, he wanted to challenge himself further and test his capabilities in a primarily English-language environment. He was able to transfer to the Independence branch of the Free Library of Philadelphia through NAPCA SCSEP. He worked at the front desk, helping with as many duties as he could. Mr. Man completed extensive ESL and computer courses through the library to further improve his skills. After four months, Mr. Man received a job offer from the Independence Library in September of 2018 as a Library Assistant. He officially began his job in October of 2018. Mr. Man said, “I think this program is really beneficial for the seniors, especially for people like me who could not find a job.” He believes that SCSEP is a truly helpful program for not only seniors who are looking for jobs but for Asians who struggle with English. 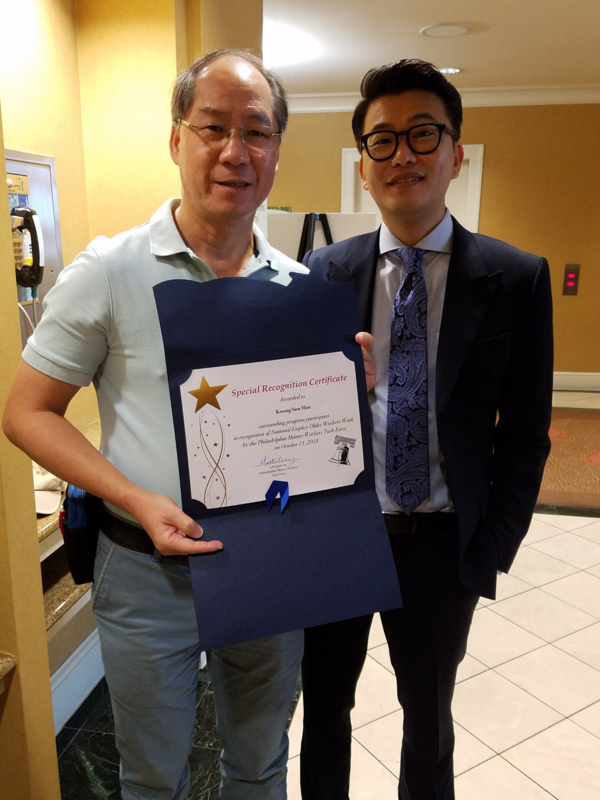 At the October 11, 2018 National Employ Older Workers Week Recognition Breakfast hosted by the Philadelphia Corporation for Aging, Mr. Man received the 2018 Employee of the Year Award. Mr. Man exemplifies what can be accomplished as a SCSEP participant with NAPCA. To learn more about the people that NAPCA serves, you can read more stories. To make progress possible for more seniors like Kwong Sun Man, donate now to support the continuing mission of NAPCA.